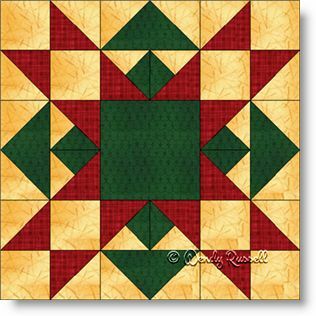 The Christmas Star quilt block is a little more challenging than some blocks, simply due to the number of cut pieces that make up the block. However, with careful attention to sewing an accurate quarter inch seam allowance, you can make this block with ease. Half square triangles are many, and a few quarter square triangles are used as well. Just take special care with the small quarter square triangle pieces, as the placement of some of the pieces result in mirror image patches. Of course you are not required to use the standard Christmas colours for your quilt, but I thought it was appropriate, given the name of the quilt block. Enjoy the process of playing around with the quilt layout and see what other interesting arrangements you can come up with.